Written by: Rebecca Miller on July 14, 2018. Roger Perry, 85, passed away July 12, 2018 at his home in Indian Wells, CA after losing his battle with prostate cancer. 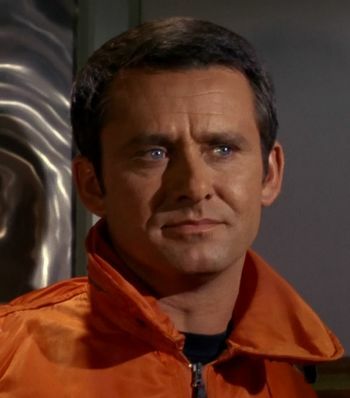 Perry is best remembered for his role as Captain John Christopher in the original Star Trek episode “Tomorrow is Yesterday”. He also starred in both the Count Yorga films and in the B-movie The Thing with Two Heads. Perry not fairing well in the Count Yorga, Vampire poster. the monsters who held her, not realizing they were her family. 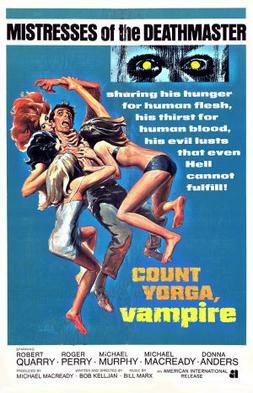 In the 1970s, he appeared in both Count Yorga films, fighting the title vampire as two separate doctors. He played a doctor again in the Ray Milland and Rosey Grier nonsensical B-movie, The Thing With Two Head. On the small screen, he will be best remembered for his role as Air Force Captain John Christopher confronted by an Enterprise transported into the past in Star Trek. A role he was uniquely qualified for, having served as an intelligence officer in the United States Air Force before pursuing acting. He went on to guest star on many television series through the 1970s and 1980s, such as, Emergency!, The Andy Griffith Show, Ironside, The F.B.I., The Eleventh Hour, The Facts of Life, Adam-12, and The Bionic Woman. Not only was Perry an actor, but also a composer and songwriter, writing songs for Barbara Streisand and scores for L.A. theater productions. Our hearts go out to Perry’s family and friends. His family is asking for donations to be made in his honor to the River Bridge Regional Center for Abused Children in Glenwood Springs, Colorado founded by himself and his wife.